Twigz make a great range of robust gardening toys for kids, with no compromise on quality and strength. More than just a selection of small garden tools, Twigz also wants to help children learn more about the environment and how to help look after it. Ergonomic designs means that Twigz garden tools can be used in exactly the same way as the adult counterparts. 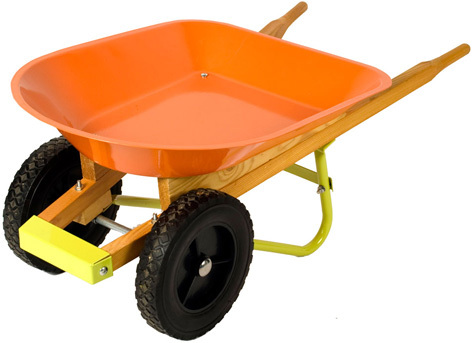 Whilst the range is not huge, every product has been carefully designed to be practical and functional, just like the wheelbarrow with its twin front wheels - these give it tremendous stability, and when combined with a wooden frame and steel tray the result is a really useful piece of equipment. A set of long handled tools is a must for every budding gardener, and the Twigz collection includes a broom, rake, hoe and shovel. Steel garden buckets in a variety of colours, watering cans to match and reinforced garden gloves are just three more examples of the Twigz garden tools range. When it’s time to get down to some serious weeding, the hand trowel, fork and rake are just the business, and with new products being introduced all the time, young gardeners should be able to have every bit of equipment they need.